Some Mexican cavefish have a mutation in an insulin receptor protein that affects blood-glucose regulation. The same mutation causes diabetes and health problems in humans, but the diabetic cavefish thrive. Sylvie Rétaux is at the Paris-Saclay Institute of Neuroscience, University of Paris-Sud and University of Paris-Saclay, Gif-sur-Yvette 91198, France. Blind Mexican cavefish (Astyanax mexicanus) live in dark caves, a challenging environment that has shaped their evolution. 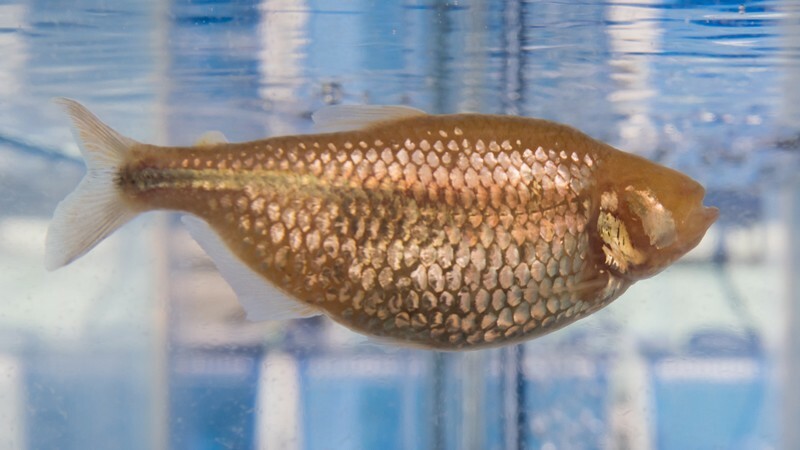 In a paper in Nature, Riddle et al.1 reveal the surprising way in which cavefish regulate their glucose metabolism, a finding that might have implications for our understanding of human diabetes. Blood-glucose regulation is essential for the body to function normally. In humans, this is achieved by a complex network of interactions between several organs that is mediated by hormones and neuropeptide molecules. After a meal, glucose levels rise, and β-cells in the pancreas release the hormone insulin. Insulin binds to its receptor on the surface of liver, muscle and fat cells, stimulating them to take up glucose from the bloodstream, and thereby returning blood glucose levels to normal. Conversely, if blood glucose levels drop, for example between meals, pancreatic α-cells release the hormone glucagon, which stimulates the liver to break down its reserves of a glucose polymer called glycogen. The release of this glucose into the bloodstream once again returns blood glucose levels to normal. Disturbance in these interplays can cause severe metabolic disorders, such as diabetes, which results in high blood-glucose levels and a range of deleterious effects. In type I diabetes, β-cells are destroyed by immune cells, and insulin is not produced. In type II diabetes, insulin is produced, but its levels are too low or it is not recognized by the target tissues. This lack of an insulin response is known as insulin resistance. Although studies of diabetes have focused mainly on mammalian systems, other creatures might offer a fresh perspective on the condition. Cavefish certainly look out of the ordinary, with their depigmented pink skin and eyeless faces (Fig. 1). Hints that these fish have unusual metabolic adaptations for coping with their lightless and seemingly food-poor habitat led Riddle and colleagues to investigate them further. Cavefish have evolved behavioural and physiological traits that differ from those of the river-dwelling members of their species. 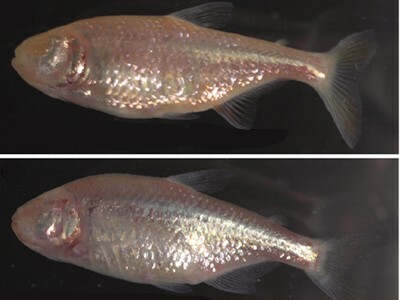 Compared with river dwellers, cavefish are fatter, owing to a larger lipid reserve; they are better able to cope with starvation2; have a lower oxygen consumption and metabolic rate3; and the absence of circadian rhythms in their metabolism enables them to make a 27% saving in energy usage4. Riddle and colleagues now reveal another metabolic surprise. Cavefish have higher blood glucose levels than the river dwellers of the species. The authors’ investigation revealed that cavefish are insulin resistant and have a mutant version of the insulin receptor, encoded by the insra gene, that does not bind and transduce the insulin signal. This mutation, in which the usual amino-acid residue proline is replaced by leucine, is identical to a change that causes diabetes and health problems in humans5,6. Hear this work discussed on the Nature Podcast. To investigate the effect of this mutation in the fish, the authors used the CRISPR–Cas gene-editing technique to generate zebrafish (Danio rerio) carrying mutated insra. This experiment would perhaps have been even more informative if performed in a river-dwelling A. mexicanus, but the results are clear: if both the maternally and paternally inherited copy of insra have the mutation, the fish are insulin resistant and overweight. The insulin resistance makes sense, given what is known about this mutation in humans, but the weight gain is puzzling and unexpected, because insulin is a growth hormone. In humans and rodents, lack of a functional insulin receptor is associated with growth retardation and low body fat7. Does this mean that insulin signalling has divergent roles in fish and mammals? Zebrafish and A. mexicanus cavefish and river dwellers have two versions of the insulin receptor gene, called insra and insrb. This raises the question of why the receptor encoded by insrb doesn’t compensate for the non-functional receptor encoded by the mutant version of insra. In zebrafish, the two receptors have overlapping roles in growth control and glucose metabolism through the action of the insulin signalling pathway, but they have opposing effects on lipid metabolism, and the receptor encoded by insra promotes lipid synthesis8,9. However, in cavefish and in the gene-edited zebrafish, the insra gene is mutated, making this weight gain even more puzzling. Perhaps one of the strangest findings is that cavefish have a respectable lifespan of more than 14 years, which is similar to that of the river-dwelling form. Moreover, they show fewer signs of age-related tissue decline. Elevated blood-glucose levels can damage tissue if the glucose bonds with proteins in a process termed glycation, which is linked to a range of health problems in people who have diabetes. However, cavefish do not have high levels of glycated proteins, so they must have evolved a compensatory mechanism. One way to unmask this mechanism might be to study cavefish in which gene editing is used to correct the insra gene mutation. The authors will undoubtedly be working on this, given the potential biomedical importance of identifying a glycation-inhibiting mechanism. Further genetic analysis by the authors reveals the complexity of the mechanism that underlies the elevated-glucose phenomenon. The beauty of studying A. mexicanus is that the cavefish and river dwellers can interbreed. The authors therefore studied the patterns of inheritance of the elevated-glucose trait, and found that insra is not the only gene involved. In the offspring of interbreeding crosses, all of the fish that had high blood glucose had the cavefish insra mutation. However, some of the fish with this mutation did not have high blood glucose, indicating that the insra mutation is necessary but not sufficient to alter blood glucose regulation. The identification of other genes involved might shed light on the weight-gain phenomenon. About 30 caves in Mexico are home to cavefish colonies10. Some of these populations arose from independent colonization events by river-dwelling ancestors. The authors compared three cavefish populations — two from the Tinaja and Pachón caves, which are in the same mountain range, and the third from the Molino cave in another mountain range. The authors found that all of these populations have high blood-glucose levels, but only those from Tinaja and Pachón have the insra mutation. Another mechanism must be at work in fish from Molino. The authors’ analyses suggest that the insulin signalling pathway is unaffected in these fish, which also have high levels of glycated proteins. Molino cavefish have lived for more than 13 years in our laboratory, suggesting that they also cope well with their unusual metabolism. The convergent evolution of this extraordinary blood-glucose dysregulation, through different mechanisms in fish from different caves, seems counter-intuitive in terms of species fitness. What compensates for this surprising evolutionary path? The authors suggest that high fat reserves might help the fish to survive during extended periods of food deprivation. However, perhaps something else is at play. Caves are probably not as food-poor as they seem. In the Tinaja cave (home of the main population investigated by Riddle and colleagues), the cavefish feed on mud that has a high carbon content11. Moreover, a substantial proportion of the fish in the Tinaja and Pachón populations have only one copy of the mutant version of insra. If a beneficial mutation has not spread throughout an entire population, one possible interpretation is that the mutation arose relatively recently in the population’s history. This would imply that the early cave settlers did not have the benefit of being fat and starvation-resistant. Exciting times lie ahead for explorations of the metabolic and adaptive changes that occurred as different cavefish populations evolved, and such studies might uncover the underlying evolutionary forces responsible for this striking metabolic adaptation. Riddle, M. R. et al. Nature 555, 647–651 (2018). Aspiras, A. C., Rohner, N., Martineau, B., Borowsky, R. L. & Tabin, C. J. Proc. Natl Acad. Sci. USA 112, 9668–9673 (2015). Hüppop, K. Environ. Biol. Fishes 17, 229–308 (1986). Moran, D., Softley, R. & Warrant, E. J. PLoS ONE 9, e107877 (2014). Atray A. et al. J. Diabetol. 4 (2), 2 (2013). Carrera, P. et al. Hum. Mol. Genet. 2, 1437–1441 (1993). Savage, D. B. & Semple, R. K. Curr. Opin. Lipidol. 21, 329–336 (2010). Toyoshima, Y. et al. Endocrinology 149, 5996–6005 (2008). Yang, B.-Y. et al. Am. J. Physiol. Endocrinol. Metab. http://dx.doi.org/10.1152/ajpendo.00227.2017 (2017). Mitchell, R. W., Russell, W. H. & Elliott, W. R. Spec. Publ. Mus. Texas Tech. Univ. 12 (1977). Simon, V. et al. EvoDevo 8, 23 (2017).